Your job sounds incredible. What is it really like? I’m very lucky to be doing what I do and to have made a successful career from it, leading to me now working at Potters. I started at Potters about a year ago and got introduced to the Resort by the Theatre Company manager, Laura, who I knew. She asked me to make a Queen of the Night style outfit for A Night at the Movies. I initially said no, but she asked me to come and see what they do at Potters and see one of the shows. I came to watch the Great American Songbook, and just fell in love with the Atlas Theatre and the whole Resort. I didn’t expect the quality at Potters and how it is like a cruise ship on land. It is truly like a Vegas show and cruise ship rolled into one, and is way above what I ever expected. Of course, I then wanted to be involved and got offered a full time position at Potters. I try not to get attached as things can easily get ripped, and suffer from general wear and tear. Our Company are on stage every day, so all the costumes need maintaining. I love the beast one though as it took me three days to make it and do all the embellishments. Even when a show is running, we can reconstruct and remake the costumes a few times during the shows run. And we’re not afraid to totally change a costume if we feel it’s not right. My favourite show so far is Hits of the Decades. Really well and I’m so excited about some of the new shows, like Around the World in 80 Days. There may be some air hostesses, carnival and can can dancers guests meet along the way, but my lips are sealed! And we’ve already started to talk about Christmas. How does the process work of designing and making the costumes? Show producer, Nicky, comes up with the show concept and then comes up with a mood board or simply says for us to work our magic. We meet up and discuss her vision, what is practical and the colour scheme, and decide what we need to buy, reuse or adapt. It’s very much a team effort, like everything at Potters. I also like to take inspiration from pieces of fabric I find. I taught myself to sew. When I was five I had a model theatre and I rigged it all up with lighting. I started with a love of the theatre and lights, and I think for this job that it is so important to consider how light hits a costume, and to think about the sets when designing something. Sewing came later, but I won’t make my own clothes or make anything for friends or family either – my work is purely for the stage! How did you get into this as a job? I studied commercial horticulture as my parents wanted me to! At Anglia Polytechnic university I got involved with the theatre and they found out I could sew. 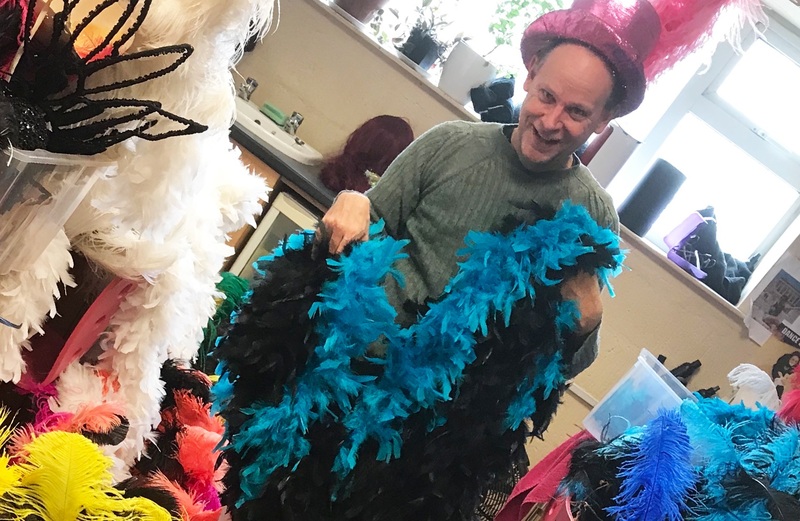 What started as a favour, ended up with me running one of the biggest wardrobe departments in Cambridge and then led me to me working on the pantomime there for four years. I was head of wardrobe for a burlesque style nightclub in Montreal for seven years, headed up a Cirque du Soleil tour, worked for Norwegian cruise line and for Disney cruise lines for five years. I’ve also worked with the likes of Jennifer Hudson, Thandie Newton and Sacha Baron Cohen. Just before Potters I had some kidney problems and was on dialysis, but managed to do some volunteering at the theatre because I wanted to carry on doing what I love. I specialised in period costumes for a long time and the jacket Sion wears singing All You Need Is Love in the Hits of the Decade show is from the English National Theatre. Some of the villager costumes are from the Royal Opera. I’ve worked in the industry for 30 years and feel very proud to be doing this job and seen as being talented. Can you tell us some facts about your job? Each cast member has around 100 items in each of our shows, including the costume, wigs, shoes, jewellery and accessories. When we get a new cast changeover, these need to be adjusted or remade and we only have a week or so to do it for thousands of items! We do 150 loads of washing a week, get through 10km of thread a year and about 70,000 rhinestones a year. Just one can can dress uses 20 metres of fabric! We have three store rooms full of costumes and have also just expanded into a bungalow as we have so much. We do have brutal quality control though and will reconstruct entire sections at the last dress rehearsal if we have to in order to get it right. What kit do you need to do your job? A good sewing machine, we have two, and an overlocker, decent working lights, a magnifying glass and quality scissors. You need to have something else so you can switch off and I do like gardening, and I do my neighbours garden and like visiting gardens. Of course, I have a passion for theatre too. Thanks to Martin and our hugely talented wardrobe department for all the amazing costumes they create and look after.